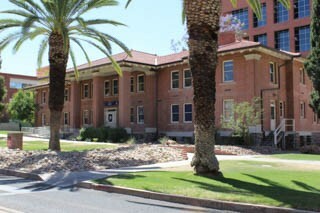 South Hall, the NROTC dorm for UA students. As of this Fall, active-duty military undergraduate students at the UA are eligible for a significantly lower tuition rate than the average student. This tuition reduction includes National Guard and Reserves. The cost of one credit hour will be $250, which is two times lower than what a regular student pays. The U.S Department of Defense covers tuition costs up to $250 per credit hour, which in other words, means many of the students will be able to attend the UA for free, according to the UA News press release. All UA campuses, including online, offer tuition reduction for active-duty military. According to the press release, the UA is home to nearly 100 active-military students that qualify for tuition assistance. The tuition reduction is an effort from the UA to show its appreciation to active-duty military. Jeff Goldberg, acting provost for UA, believes this will open doors to boost partnerships with military branches and to students who may have looked at other options to pursue their degrees. "Our servicewomen and men are a vital part of both the UA student body and the country's workforce, and we as a university are committed to their graduation and lifelong success," said Goldberg in the press release. The tuition assistance for active-duty military was announced at the Southern Utah vs. UA football game earlier this year.